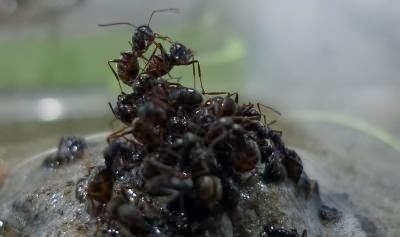 When hit by floods, ants display an extreme ability to assemble together as a group and form floating rafts using the brood's buoyancy to save themselves as well as the queen. The study led by researchers from University of Lausanne, Switzerland, reveals the strategy used by ants to face floods and protect the queen including the larvae and pupae. The researchers observed that the ants build floating rafts and use the whole brood's buoyancy and the recovery ability to lower the rate of injury and death. Also they place the queen in the middle of the raft and protect it from all sides.